Krispy Kreme's Chocolate Glaze Collection consists of four new donuts: the Chocolate Glazed Cake Batter Donut, the Chocolate Glazed Raspberry Filled Donut, the Double Chocolate Glazed Kreme Filled Donut, and the Chocolate Glazed Oreo Cookies & Kreme Donut. They usually go for about $1.29 or so a piece but I was able to try all but the Double Chocolate Glazed Kreme Filled Donut courtesy of Krispy Kreme. It should be noted that all four donuts feature a chocolaty yeast shell that's glazed in chocolate. The shell offers a light cocoa flavor and the soft, airy texture of a yeast donut. Most donut shops don't make a chocolate yeast donut and Krispy Kreme is only carrying them for a limited time so you might want to give it a go just for curiosity's sake. The chocolate glaze that covers the donuts all around is similarly light on the chocolate flavor and fairly sweet. The Chocolate Glazed Oreo Cookies & Kreme Donut takes the chocolate glazed chocolate donut and pumps in a cookies and Kreme filling, dips it in chocolate icing, and tops it off with Oreo cookie pieces and a drizzle of chocolate icing. The enjoyable filling tasted exactly like Oreo vanilla creme mixed with granules of Oreo chocolate wafers. Unfortunately, it got a little bit lost between the sweetness of the chocolate icing, chocolate glaze, and more chocolate icing. I kind of wish they had just made a chocolate donut split in half with the cookies and creme filling in the middle (i.e. basically a giant donut version of an Oreo cookie). While they were all very sweet, the Chocolate Glazed Oreo Cookies & Kreme Donut is definitely the sweetest of the three donuts I tried. 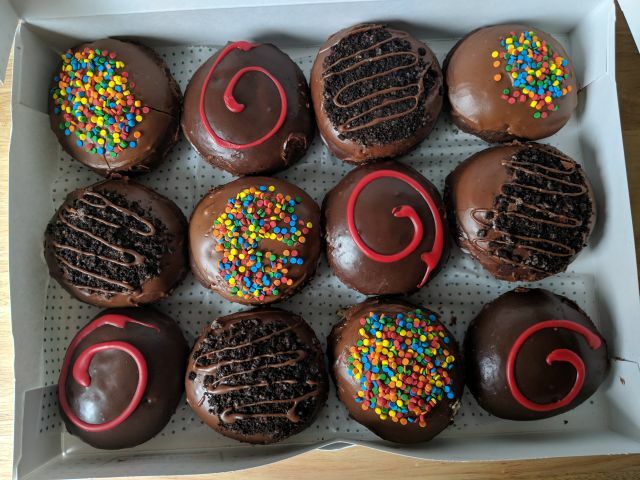 The second sweetest was the Chocolate Glazed Cake Batter Donut, which is filled with cake batter, glazed in chocolate, dipped in chocolate icing, and topped with rainbow sprinkles. With the same chocolate donut, glaze, and icing, it's mostly the same as the previous donut, which is to say it was very sweet and somewhat chocolaty. The batter gave it a cake-like feeling that made me wish that there was some cake frosting involved. The rainbow sprinkles added a contrasting crunch and only a light sweetness. The Chocolate Glazed Raspberry Filled Donut comes filled with raspberry, dipped in dark chocolate icing, and finished in with a red icing swirl. The raspberry was fairly liquid compared to other jelly fillings I've had. It was generically berry in flavor, which paired well with the light chocolate notes of the donut overall. The dark chocolate icing was more notable for its lesser sweetness than for any bittersweet chocolate notes. Overall, I liked the Chocolate Glazed Raspberry Filled Donut best out of the three Krispy Kreme Chocolate Glaze Collection donuts that I tried as it was slightly less sweet and slightly more chocolaty. 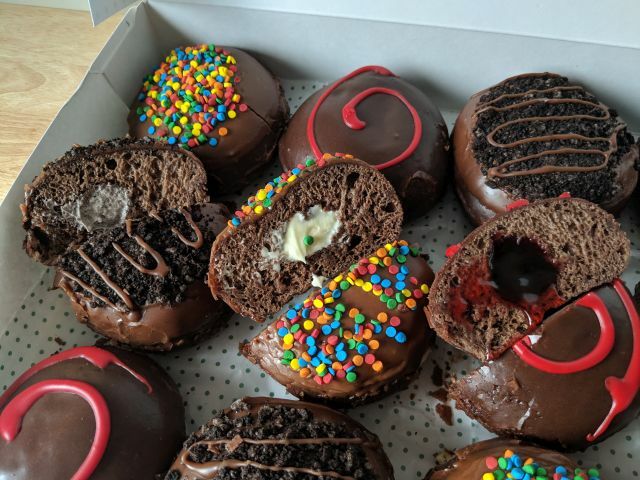 I really enjoyed the cookies and Kreme filling of the Chocolate Glazed Oreo Cookies & Kreme Donut but would have liked to see it showcased more, while the cake batter of the Chocolate Glazed Cake Batter Donut paired rather well with the chocolate donut.